For many years I’ve been telling folk tales and fairytales to children, especially around Halloween time, and one of my (and their) favourites is a story from the Lincolnshire fen country called ‘The Dead Moon’. In brief, it’s the tale of how the Moon herself came down one night to see the dangerous boggy fens, full of corpse- candles and dead folk and other creeping horrors - and was seized by the bogles and pulled down into the bog so there was no more moonlight to help travellers find their way. How the story ends you can find out in Katharine Briggs ‘A Dictionary of Fairies’. 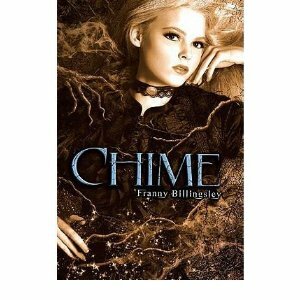 ‘Chime’ by Franny Billingsley is not the tale of the Dead Moon, but it’s set in the same kind of world, and I feel sure she must know the story. Briony and her sister Rose live in Swampsea, a small coastal town surrounded by dangerous and wild swamplands inhabited by spirits who must be either avoided or placated: ghost-children, the Boggy Mun, the Wykes, and the Dead Hand - while the estuary has its personified tidal wave, Mucky Face. Briony, the unreliable narrator, is a bitter, damaged girl who holds herself accountable for far too many accidents. She adores the memory of her beloved Stepmother, resents her quiet, apparently uncaring father, and spends her days and nights looking after her beautiful but difficult sister Rose. When golden-haired, charismatic Eldric arrives in Swampsea, it takes her a while to adjust to his sunny, light-hearted ways. Slowly he begins to show her how to enjoy life. But she has secrets - dreadful secrets. Terrible things have happened in Swampsea. Witches are evil. And Briony knows she is a witch. Next time, Briony, keep your promise to Stepmother. Don’t pretend you’re interested in doing good. How long can a clever girl trick her own self? It’s been three years since you learned you were a witch. Perhaps you didn’t kill Stepmother, not technically, but that doesn’t mean St Peter’s going to wave you through the pearly gates. Slurp and swallow, slurp and swallow. Mr Dreary had vanished. Too late to pull him out. The false lights had vanished. Everything had vanished except Eldric and me. Everything had vanished except the two of us, the lantern, the stars, and the swamp, which breathed slowly through its jellied lungs.